Growing your own orchard is a lot of fun and rewards you with mouthfuls of summers ripest peaches, nectarines, apricots and plums. You also know what has been applied to the soil and sprayed on your trees, like us you may want to grow your fruit the organic way. 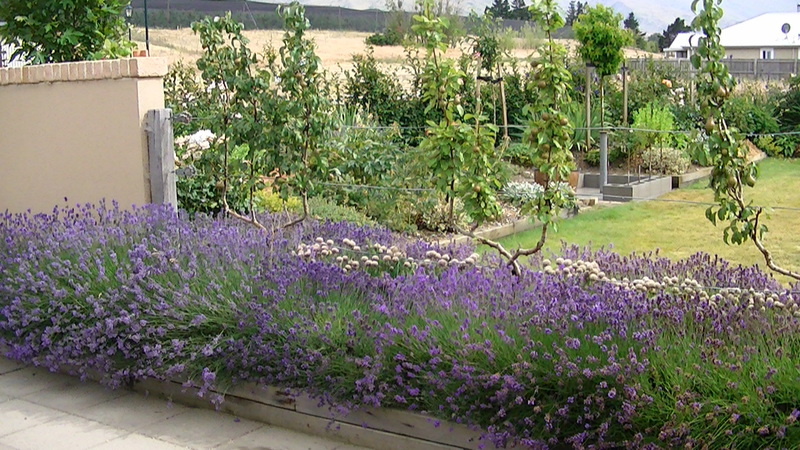 Lavender and Thyme Cottage has over 40 fruit trees including many heritage varieties, mostly espaliered. There are many espalier shapes at the cottage with my favourite no doubt, the pear candelabras. 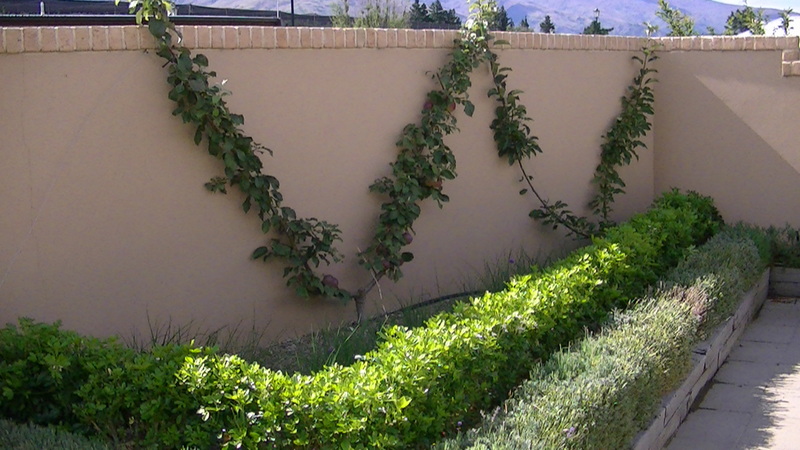 The other espalier shapes are fans, diamonds and the traditional tier shapes. Espalier allows smaller gardens such as our 1/4 acre plot, to have an increased number of varieties per m2 than a traditional orchard. We use lots of lavender and strawberries in the garden to bring in the bees and have garlic planted underfoot as a healthy deterrant for bio-control. The orchard trees at Lavender and Thyme Cottage are wonderful producers, we aim to treat them with lots of love and care. The trees provide our family with lots of healthy vitamins, minerals and all those good for us- antioxidants. Please go and plant yourself a tree or more! For your information the essential difference between cordons and espaliers is that cordons are grown at close planting whereas espaliers are grown on more vigorous stocks at more distant planting. 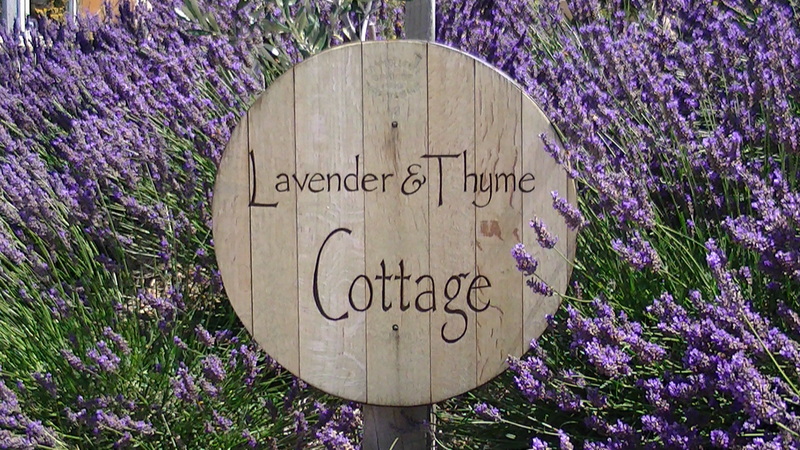 At “Lavender and Thyme Cottage” the fruit trees are mainly grown as cordons. The true cordon is a single straight rod grown either erect or (preferably) obliquely. Mulitple cordons such as the lattice styles (belgian fence and diamond), double “U”, candelabra and triple cordons are useful systems for the more vigorous varieties. Cordons and espaliers are usually grown in rows supported by a wire fence. In open ground they should run north and south to secure sunshine on both sides of the row. A row grown near walls or hedges which are likely to shade, should run as near east and west as possible. Posts should be about 10ft apart and protrude 6ft above ground. Three wires are usually enough to support cordons, some espaliers may need five wires. The bottom wire is usually about 60cm from the ground and the others are 45-60cm apart according to the height of the posts. In a general sense there are two types of fruiting trees- spur bearing such as most apples and pear trees, or tip bearing trees. Spur bearing trees are ideal for espalier as you won’t prune off the new fruiting buds when trying to maintain a cordon or espalier shape. 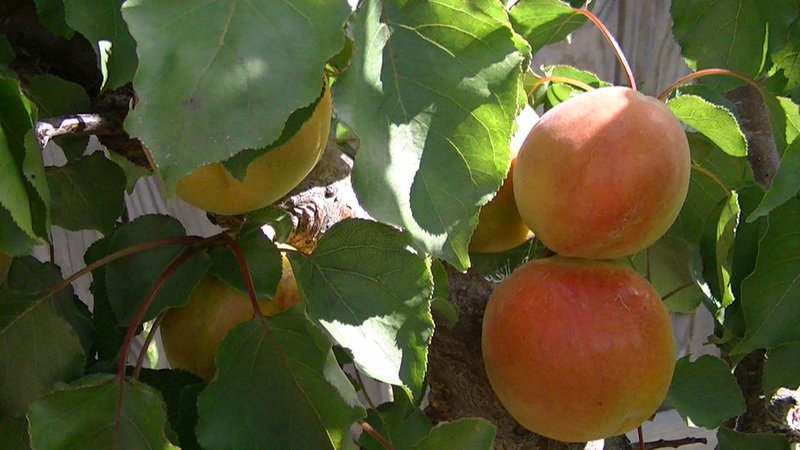 Although it’s not impossible to espalier tip bearing tree such as apricots, plums, cherries, peaches and nectarines you will be restricted mainly to the fan espalier shape. Obtain a tree variety with good disease resistance- espaliered trees will undergo more pruning than standard grown trees. Consider also heritage varieties as espalier is a traditional method for growing fruit trees- they also create a charming talking point in your garden. I would recommend a dwarf stock variety for a single cordon and semi dwarf to vigorous for all other styles. Tree varieties with moderate vigor are more suited to bending into complex shapes. It’s important to remember that the more horizontal a tree branch the slower the sap flow therefore the slower the growth. If you want to slow down a vigorous tree create more espaliered horizontal branches. Training Single cordons is simple. Obtain a one-year old unbranched whip. 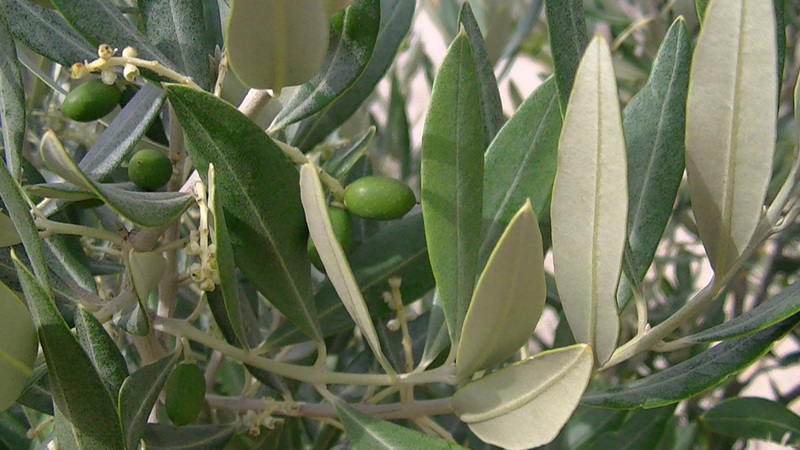 The top may be lightly pruned after planting and any side shoots shortened to about three buds. If modifying a branched tree, select the straightest leader and cut the rest back. For upright cordons the rods are planted erect and oblique cordons are planted on an angle to how they are to be trained. The annual growth of the upright leader is seldom cut. There are a few exceptions such as the cordon not producing enough side shoots- you would shorten the leader by half, or if the fruit buds are only on the terminal end of the leader- you can shorten by 5cm, or if the leader has reached the top wire- prune to the desired height. Training U shaped cordons requires an unbranched whip to be shortened to 45cm from ground level. The cut should be made so that two buds are opposite each other. When new shoots develop tie each leader in opposite direction to the lowest wire. Do not shorten these leaders. All other shoots are pruned right back. I recommend that the terminal end of the shoot be allowed temporary freedom to grow upright otherwise the vigor of the tree is lost. The following winter the two rods should be shortened to 45cm. The growth of the two end buds is then trained vertical and tied to upright bamboo canes attached to the wires. Training Triple cordons is similar to the U cordon except that in the first summer three shoots are retained, two to the sides in opposite directions while the third is trained erect. The following winter the two horizontal rods should be shortened to 45cm. The growth of the two end buds is then trained vertical and tied to upright bamboo canes attached to the wires. Training Double U, Candelabra and Multiple cordons are variations of these methods. The candelabra requires a crossing over of its two side branches to create a circle prior to the branches being shortened to 45cm. Recommended planting distances are 45cm apart for Single cordons; 60cm apart for Lattice cordon (belgian fence or diamond style); 4ft for a Double “U” cordon, Triple or Multiple cordon (includes Candelabra style); and 6ft-16ft for an espaliered fruit tree. Tying with elasticised nylon should be done from time to time throughout the season as growth extends or before wood becomes too rigid. Ties will need to be loosened each year as the girth of the rod increases. Light pruning should be done during summer period when disease prevalence is lower while hard pruning should be done during the dormant winter period. shape,could you advise nyone that has these to sell. Thank you for your question. If you reside in New Zealand you could contact Waimea nurseries, Nelson. They may know of any growers that are developing commercial espaliered pears. It is also worthwhile developing them yourself, it just requires a lot of patience and tender loving care. I recommend the pear varieties I have listed on my website. Two different pear varieties should be grown in close proximity to each other to enable optimum pollination. Thanks again. I have just bought 2 fruit trees that have 3 different variety’s grafted into each one. An apple and a Nashi. I was told that they would be good to grow this way [but I have never done this before] as we have a very small backyard and could put them against the fence running North to South. However after reading your information this does not seem such a good idea as of course it can be in the shade at this time of the year. Should I change my plans or is it possible to give it a go. Would very much appreciate your thoughts as to how important it is to keep them out of the shade. It’s so exciting starting a new garden. For espalier I recommend that you use dwarf varieties for single cordons only. Most of my trees are vigorous varieties, although I do have some semi dwarfs. When the branches are horizontal it slows the flow of sap, this then slows the growth of the plant. If you use a dwarf variety for other espalier styles the growth rate becomes quite stunted, and hence with will take a long time to develop into an espaliered shape. My quince and cherries are grown in fan shapes as they are tip bearing (fruit on the end of branches) while my apples are a mixture of Candelabra and Belgian fence style. 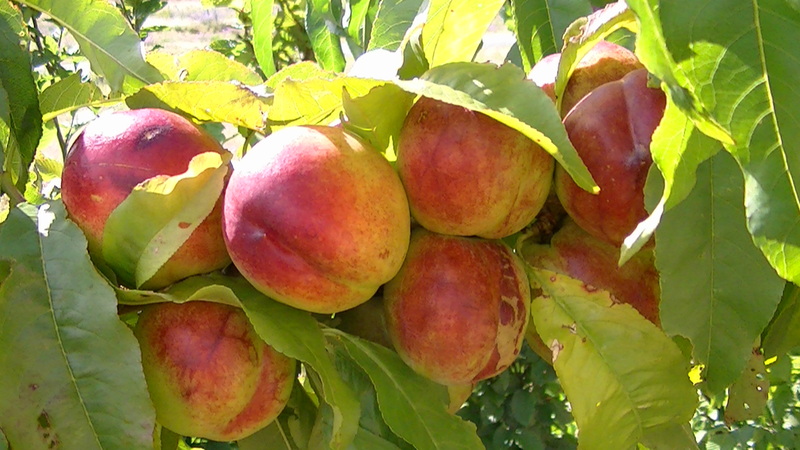 Because stone fruit is tip bearing the other decorative shapes would prevent fruit development as you would be pruning off the tips to create the espalier. You do have enough room for one beautiful fan shaped espalier- quince have beautiful flowers as well which could look quite lovely! I really hope this helps. All the best for your gardening. Hello and thank you for the wonderful post. 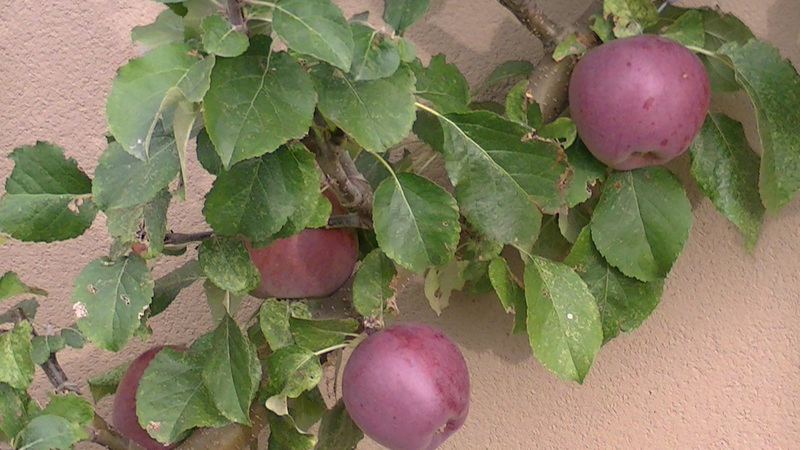 I am planning to put a lot of fruit trees into my small-medium sized property so of course I am planning to espalier. I am considering a Belgian fence style for apples and pears to be placed against my lattice wood fence (south facing). We live atop an exposed hill and sometimes get sundowner winds in the summer. Will this occasional wind damage the fruit trees against the open lattice? Should I consider a more sheltered spot. Also, what do you think of alternating the apple cordon with the pear cordon to achieve the Belgian fence style? Thank you. I’m interested as to what style you’ve espaliered your Feijoa Unique as I’ve just bought one and want to grow it this way. Hi. I have just purchased two apple tress which I want to Espalier. Both are on dwarf stock. I have a 3 tier wire frame already set up on my north facing fence,and I find that the trees are tall enough to do all three wires straight away. Is this recommended or should I just start of at the bottom with the first two branches on the bottom wire only. Sorry, but I didn’t really explain myself properly there. 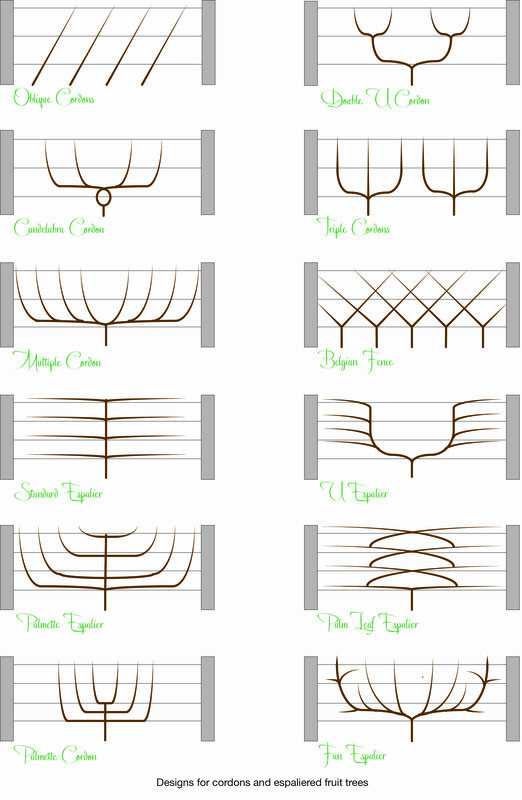 I will be doing the Standard Espalier, and as my tree’s main stem (which does not have any side shoots on as of yet), is tall enough to cover all three horizontal wires, I was wondering if I should get the buds lined up on these wires and do all three at the same time, or should I cut the main stem down to the bottom wire and start there. The tree is not planted yet so I can adjust the height accordingly. Hello, is it possible to grow a feijoa in espaliet ? I was thinking of the ” unique ” one. Many thanks. Do you ship to Washington State? I need to order a tree for espalier.